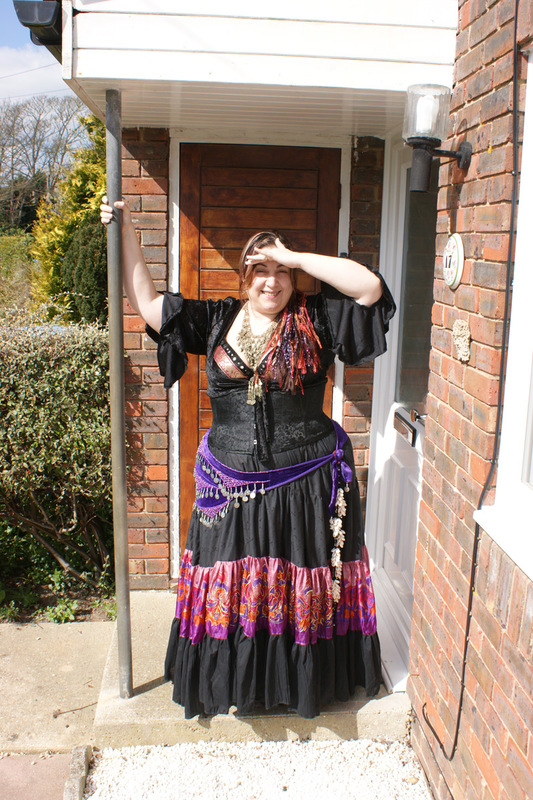 One hears “12 metre skirt” and thinks of stupidly long trains in wedding gowns or fantasy outfits, more suitable for throwing down a window for Prince Charming to use as climbing rope, not belly dancing. And yet, we get these “9 yard skirt, 12 yard skirt, 25 yard skirt”, all the time, and a lot of people wonder exactly what this is about. These numbers, boys and girls, refer to the diameter, or length of the bottom layer of the skirt if it was a single line and you were measuring from end to end. Everybody tells me that I am a sucker for punishment when it comes to making things, virtual or real, and when my teacher Val offered me a sari, I saw the perfect opportunity to finally put together one of those humongous skirts that I kept hearing about. The process was relatively simple, although not exactly painless, but was thankfully made much easier by an overlocker (aka serger), otherwise I would probably have gone nuts before finishing. These skirts are a staple of most dancer’s wardrobes, but quite often you will find that they are on sale for quite a pretty penny (£60 and up is not uncommon), and for the plus sizes, the waist in these can often be too tight. Also, using the same skirt for practice, class and performance can take its toll on it, so having a cheaper version sounds like a good idea. By all means, have that expensive skirt handspun by golden-haired maidens if you like it, but keep a cheap version that you can easily repair or remake at hand for class and practice, you will thank me when you do. There are, of course, other reasons to doing this. Again, typical of plus sizes, and other women with perky big bottoms, is that most of the time, skirts hanging from our rears end riding higher up on the back. This annoys me inmensely, and I hate the idea that I need to adjust the front to take this into account, and therefore have a skirt shorter than I would want. The solution is to make your own, and make it GOOD, with the extra inches added by your perky, delectable bum taken into account while drafting. How do we do this? Follow me! First: decide where you want your skirt to start, and to end. Measure as necessary, preferably with a friend -or supportive SO- and take account of the front, back, and if necessary side measurements. Third: decide how long you want the bottom edge to be. On my monsterskirt, it’s 12 metres, you might want it bigger or smaller; this depends a lot on what you’re using it for. 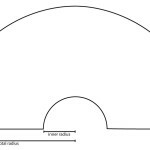 Fourth: calculate the shape and size of your tiers. Start at the bottom (tier 4), then half that length for the tier above (tier 3). Repeat until you’ve run out of tiers, and make sure that your top layer fits (needs to be bigger than your hips by at least 4 inches, although I would recommend quite a bit more). If it doesn’t, make the difference between the top two tiers time and half what’s above instead of double (or simply, multiply tier 2 by 0.66 then round up). Fifth: trace and cut the bottom three tiers; you might need to do this differently depending on the width of your fabric and whether they can be cut across the grain or not, but effectively you will end with very long rectangular pieces. In some cases you will have to assemble them out of several smaller pieces cut on the grain. 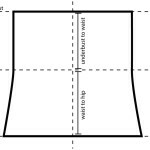 Remember to add the seam calculation to the height calculation (27cm instead of 25cm in our example). Sixth: for the top tier, trace the bottom edge as an even line; if you can do this piece as a single piece it WILL make your life easier, but if you have to split them in front and back because of fabric width, make sure you mark them as front and back. Now mark the side seam(s), centre front and centre back points. In my example, the marks were at 0, 37.5cm, 75cm, 112.5, and 150cm. Take the initial length measurements you obtained, sustract the expected length from the bottom 3 tiers, then 3cm more for the waistband, then add 2cm for seams. In my example, with 100cm for the front and 110cm on the back, and 3x25cm tiers, the top tier would be, if even , 24cm at the top front, and 34cm at the top back. Mark these perpendicularly to the bottom edge, at the 37.5 and 112.5 marks. If you have side measures that are different, calculate them the same and add them at the 0 and 150cm. Now join all four points, making sure that the transitions are smooth, and remember to mark your front and back. This curve will be more or less pronounced depending on how big the difference between the front and your back is. Check the graphic for more detail. Now put all the tiers together. Start whichever way you want: top to bottom, bottom to top, middle to top and bottom. The ONE thing I suggest you do is doing the hem for the bottom tier before attaching it to the rest of the skirt, otherwise the amount of fabric will make it seriously unmanageable. Remember that you are not going to make this layer even, you will adjust the length by adjusting the TOP. This also means that you can easily use different fabrics for a splash of colour without risking it looking “wrong” because it’s suddenly hitched up on the back. If you’re not sure how to do the gathering without wanting to disembowel yourself with your good fabric scissors, check out my post on gathering without loosing your sanity. Make a waistband with a long strip of fabric, same length as your top tier, 8cm high. Fold in two, pin the bottom edge to the top tier, making sure to put the seam at the front if you’re using drawstring so you can have the strings out at that point; you might have to gather it a bit if your top line is very curvy. Leave a small gap, pass elastic, and once you’re sure it works on you without cutting circulation or falling off, sew both edges together. Add a pull cord if you want too, then try it all to make sure the bottom edge is even all around, and marvel at your lovely new monsterskirt with an even edge. If everything is ok, sew, and if not, adjust the waistband and first tier accordingly; it should be far easier to adjust a much smaller section than to deal with a humongous hem. On the left you will see a photo of a costume that I created almost entirely myself, showing off this skirt (click for a bigger version). You can almost see how even the whole thing is, and it’s even more, I promise; I just forgot to check and adjust after adding the belt and cincher before the photo. The top two tiers are made of a very light polycotton broderie anglaise, which makes the skirt quite comfy in hot weather, as it comes with inbuilt ventilation. The purple/dusk tier was made with the edges of a sari that my teacher Val gave me. The bottom is a very nice crinkle cotton, also very light; the crinkle texture makes it ideal for this sort of work as it adds an extra oomph to the gathered fabric. The skirt is a dream to use for dancing, and looks quite impressive when flounced during performances. My one complain is that I wish I had used semi-circles for the top tier to give more movement and less gathering of fabric, but I’m already planning on a second skirt, with an even longer hem, but that post will have to wait until it’s done.